Is long term investment in PSU Banks a good option? Many investors are now wondering whether the drop in share prices of PSU banks is an investment opportunity. One should consider the following factors before making a decision. Public sector banks have been suffering due to rising non-performing assets for some time now. As a result, over the last three years, Nifty PSU Bank Index has declined at a compounded annual rate of 5%. Recently, the index hit a fresh 19-month low of 2,770 on the National Stock Exchange (NSE). Moreover, the index has been trading at its lowest level since July 20, 2016. In past one month, the index tanked 16% against 1% decline in the benchmark index. 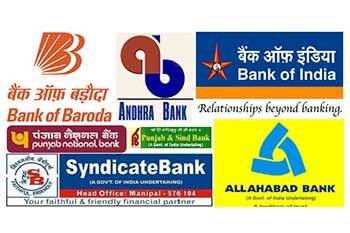 PNB, Bank of India, Canara Bank, Union Bank of India and Andhra Bank have recorded declines in their stock prices. 1. Bank stocks will depend on two factors-interest rates, a function of the government's fiscal policy and inflation, and banks' asset quality. Fiscal Deficit: By January 2018, fiscal deficit had already overshot the full-year target by 14%. With general elections due in 2019, and the proposed higher MSP (minimum support price) of farm products, oil prices and house rent allowance, the fiscal deficit could increase more. Bank Asset Quality: One of the worrying factors for PSU bank is the possibility of an increase of non-performing loans due to exposure to certain sectors. For example, the government-owned banks have lent heavily to infrastructure companies and are under stress as many projects have not taken off due to fuel shortages or lack or approvals. There is a huge risk in stressed sectors such as infrastructure (especially power distribution companies), textiles, iron & steel and commercial real estate and hence banks may see higher loan defaults and restructuring. The IMF (International Monetary Fund) had conducted stress tests on India’s 15 largest banks — 12 public sector banks and three private banks—last year. In its report released in December, the IMF said the overall system is quite resilient and 64% of the assets of the top 15 banks are with the ‘resilient’ ones. But the remaining banks, comprising of the remaining 36% of assets, will find themselves in a precarious position even under baseline assumptions. The latter set of banks are state-owned, the report noted, without revealing the names of the banks examined. Under an adverse stress scenario, nine out of 12 state-owned banks will breach “hurdle rates”, i.e. rates prescribed by Reserve Bank of India for various capital adequacy ratios. 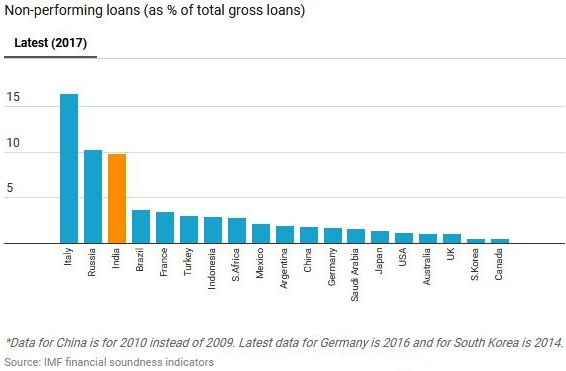 In fact, the NPA ratio of all banks of India is now among the worst in G-20. Please refer below chart. In 2009, India had among the lowest ratio of non-performing assets among the largest economies of the world, which form the elite G-20 club. Eight years later, it has the highest ratio of such assets and out of all NPAs, 80% are from PSU banks. 2. Rate Hike Probability: The latest spread in the benchmark yield over the repo rate clearly suggests that the market is discounting a 75bps rate hike. It was a tough going for banks when RBI was increasing rates. Between January 2010 and December 2011, when the repo rate, at which banks borrow from the RBI, was increased from 4.75% to 8.5%, the banking index lost 13% value, while the PSB index fell 23%. 3. PSUs have a huge portfolio of government securities: It is much larger than most private sector banks, implying that if the central bank does not offer a one-time opportunity to banks to shift bonds from AFS (Available-for-sale) category to the HTM (Held-to-maturity). The MTM losses could be higher in the fourth quarter. Conclusion: PSU banks have failed to generate wealth for investors in the long run. They have bloated cost structures, lack customer focus and are the last to embrace technology. This affects the ability to attract and retain talent. But If one still wants to buy PSU banks stocks, then the recommendation is to buy "PSU ETF (exchange-traded funds)" in a staggered manner that gives exposure to the entire basket of stocks in the PSB universe. Purely on asset quality and other factors, private sector banks are better placed. First, they have retail focus, where the risk of NPAs is low. Further, they have fewer restructured loans. Among the stocks to watch are HDFC Bank, IndusInd Bank, Kotak Bank, Yes Bank and RBL Bank.